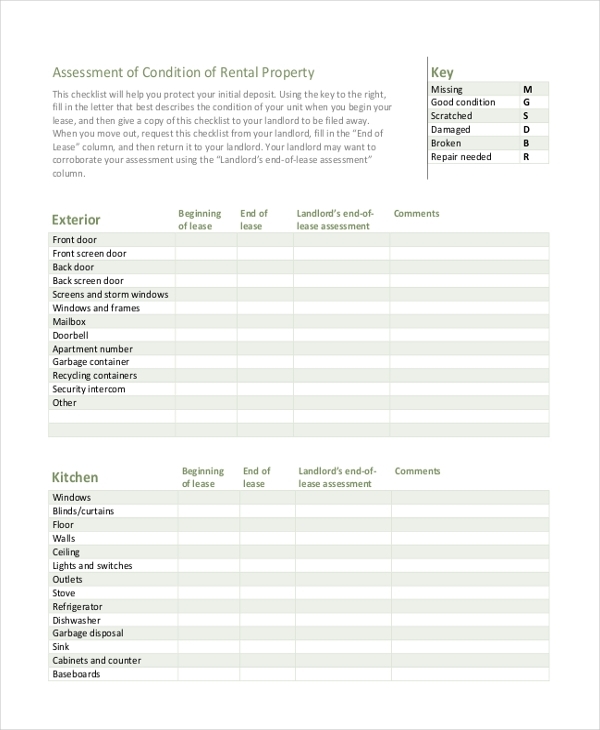 If a tenant has decided to rent a property it is mandatory for him or her to fill a checklist form indicating the condition of the overall unit. In the form, keys are given, which must be used to indicate the condition of various aspects of the property. 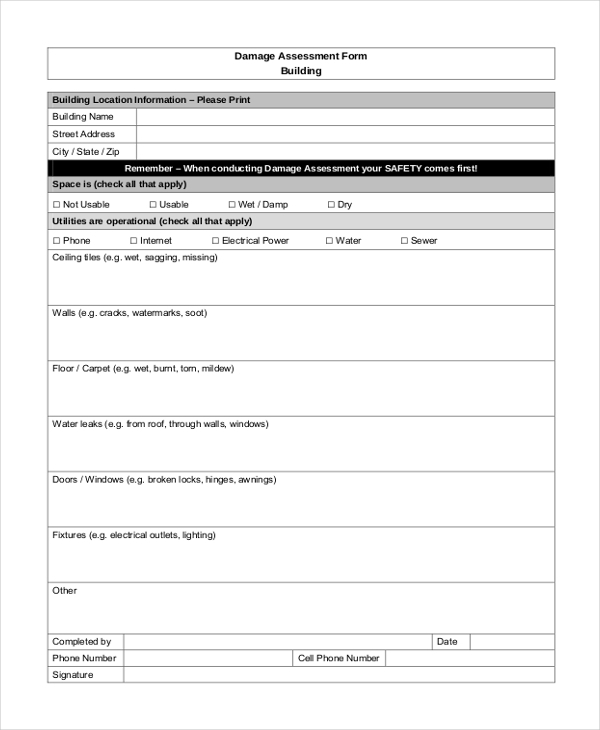 Afterward, a copy of the checklist needs to be supplied to the landlord who may want to assess the property to corroborate with tenant’s inspection details. A commercial personal property assessment form is used whenever a commercial property requires assessed for tax purposes. The form is segmented into different sections and each section contains a table which needs to be filled with relevant and accurate information. If a claimant wants to file a claim regarding the calculation of taxes on his or her property, then they need to file what is called as Property Tax Assessment Form. 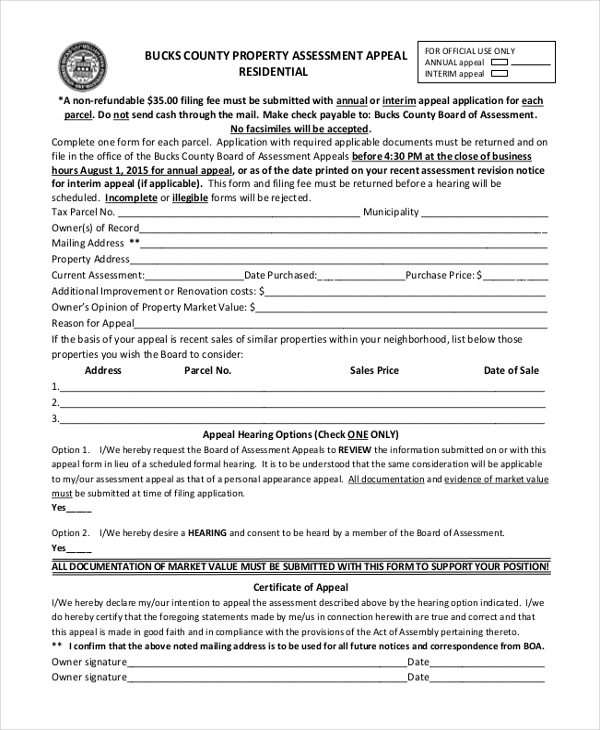 It is an elaborate form which has a list of fields that need be filled with accurate information and then submitted to the Property Tax Appeal bench that will take the inquiry further on the basis of the details provided in the form. 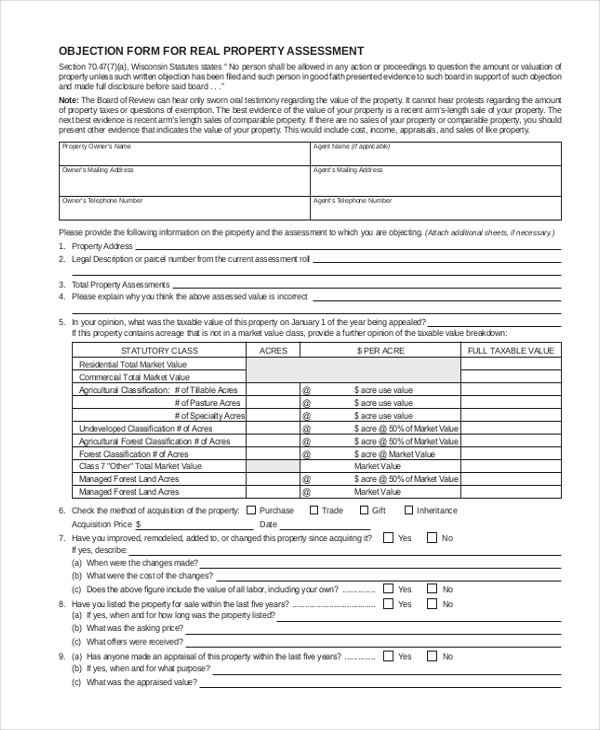 If a property is facing an ownership conflict, then this property ownership assessment form will come handy in such a scenario. 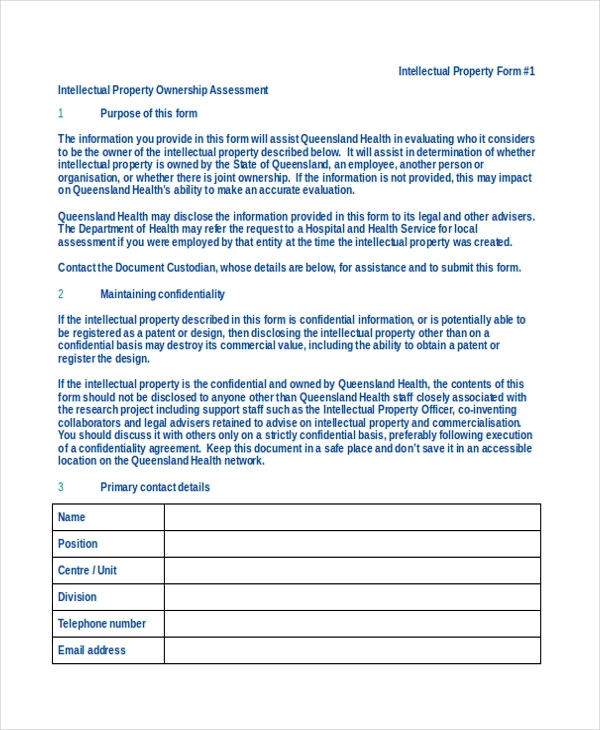 The details provided about the property in the form will help to determine which person or organization is the rightful owner of the said property. 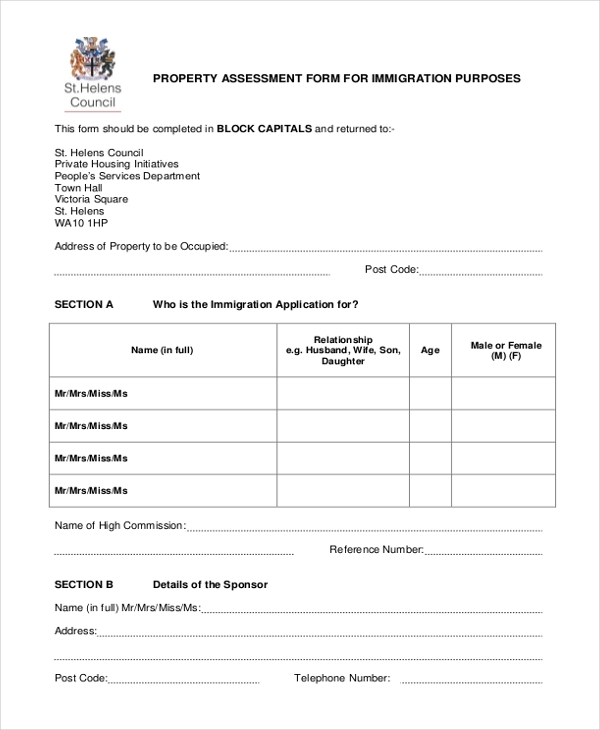 A Property assessment form for immigration purposes is useful for the situation wherein a tenant would like to have an assessor come forward and examine the conditions of a property. Where a tenant wishes to rent after immigrating from one country to another. In case a particular which has been assessed by the concerned authority is found to have been undervalued or overvalued, the current owner can contest the valuation claim by filing an objection form for real property assessment. The form serves as a document wherein the current owner specifies relevant information in the various fields given in the form. 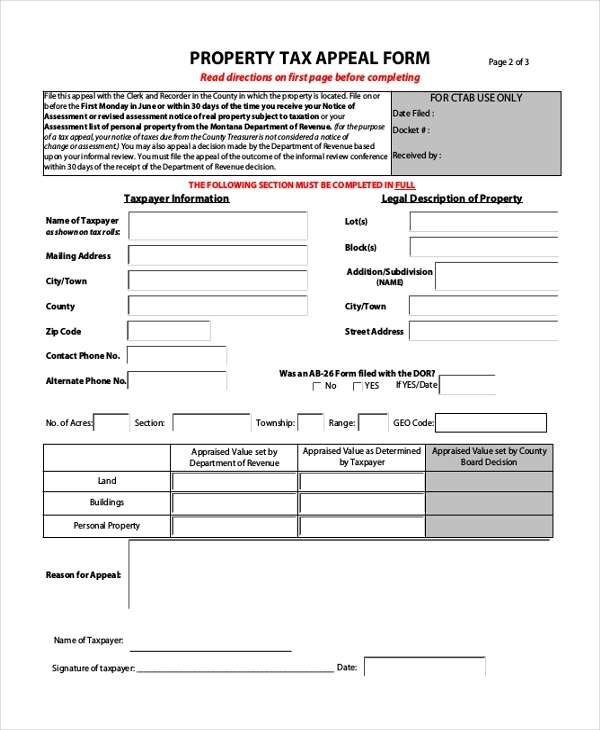 A Residential Property Appeal Assessment form comes in handy when a claimant wishes to contest and file an appeal regarding the conflict between the selling or purchasing costs of a particular property. The form must contain accurate details about the property’s overall welfare and market value. Depending on the situation, the target audience of a property assessment form could vary. Between landlords, tenants and housing authorities, a property assessment form is sought and tackled for a host of different reasons. As stated, property assessment forms are required by all the participating parties involved in a property undertaking – mostly it is property owner and tenant (if there is one.) In case the ownership of a property stands to conflict, a third party or more could also become involved in the property assessment exercise. 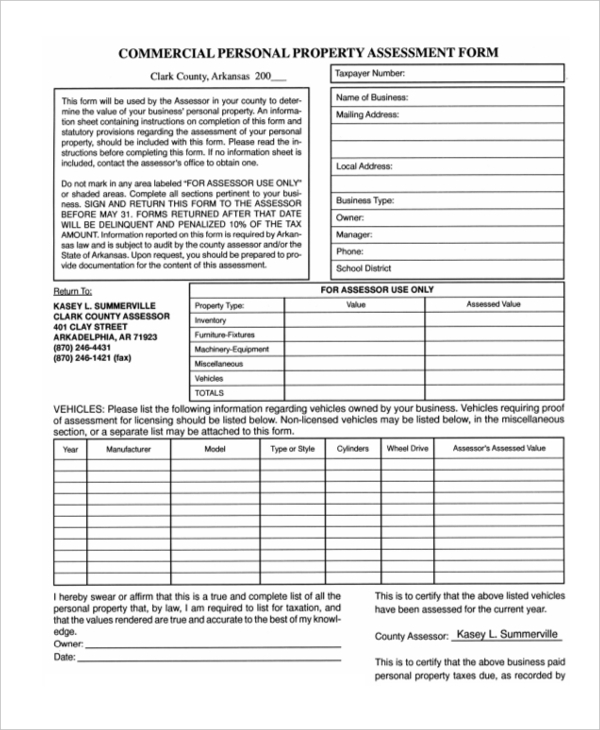 Property assessment forms are important and very useful under different kinds of situations and circumstances. Having appropriate knowledge about the purpose that each kind of assessment form entails is very crucial for both tenants and landlords. In the long run, letting or making a property undergo an assessment proves beneficial for all parties involved in the property.